A common foot solider of the Northern Kingdom of Boletaria. This low-class soldier always stands at the front line of battlegrounds. 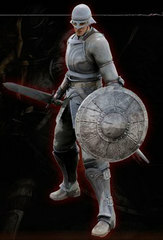 This is the standard soldier type with especially high vitality and hard armor. They wear thick armor, and are skilled with both a straight sword and a spear, thus broadening their battle style. Text of theory goes here.